Over the last five decades, we have heard a lot of buzzwords and slick marketing campaigns for the Church since the Second Vatican Council. 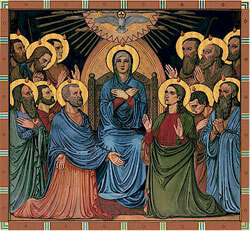 One of the most frequent is the phrase “New Pentecost.” Blessed John XXIII hoped that the Council would help bring about a new Pentecost in the hearts of the faithful and the Church. Instead of this noble sentiment, those who frequently invoke the phrase have an entirely different meaning in mind. Whenever it is used, get ready: you are about to hear something truly evil and awful about the Church before the Council. According to this telling of events, the Catholic Church was in the dark ages from a random point in Church history up until the calling of the Council, and after that, the full gospel truth would finally be lived out. By every verifiable standard, this hasn’t happened. Yet is this what a new Pentecost actually entails? A closer look at the feast of Pentecost provides a different take altogether, and suggests that Blessed John XXIII’s desire may have had a prophetic nature to it. While most people associate Pentecost as a Christian feast, its roots are actually far more ancient. According to rabbinical tradition, Pentecost is known as the Feast of Weeks, which celebrated the day when Moses delivered the law to the Israelites from Mount Sinai. Pious Jews at various times in history prepared for this feast by reading the Torah all night so that they could drink in the message of God’s law deeply that next day. During the feast, they recalled their entire salvation history, from their exile in Egypt, to their arriving in Jerusalem, and everything in between as God’s elect. When looked at from this perspective, the Christian meaning of Pentecost takes on a far deeper meaning. The Acts of the Apostles tells us that on the day of Pentecost, “Jews, devout men from every nation” were gathered in Jerusalem for the Feast. They found themselves before the Apostles, and heard the preaching of the Apostles in their own languages. (Acts 2:5-12) Looking down from above, under the inspiration of the Holy Spirit (like Moses was), Peter gave the devout men from every nation the New Law, which was the fulfillment of their own spiritual exile: salvation in Jesus Christ. Whereas Moses sprinkled the bloodguilt of an animal upon the people, Peter sprinkles the water of forgiveness and regeneration after people had received the law. From this perspective, what Catholics typically call “the First Pentecost” was actually a New Pentecost itself. Knowing this, we can glean a few things. When we say New Pentecost, we are looking to enkindle the truth of the Gospel within the hearts of our fellow Catholics. Just as the Apostles used various tongues, so are we to speak the truth of the Gospel in a language that will resonate with our brethren. While we cannot re-baptize them, we can bring them back to their baptismal calling. Any student of the last few decades can tell you this didn’t happen after Vatican II. Instead of a deepening of faith, we got Humanae Vitae. (Anyone who is under the belief that there was no problem with the faith of Catholics in those times needs to deal with the events surrounding Humanae Vitae.) Instead of increased orthodoxy, the Church seemed (paraphrasing St. Jerome) to “groan and awake with a contraceptive mentality.” Far from bringing souls back to their baptismal calling, they flee the sacraments in droves. It is not the intention of this column to argue the question over how much blame the events of the Council played in these events. I will argue that one of the primary reasons the New Pentecost seemed to fail so spectacularly is because for the most part, we (whether lay or cleric) haven’t even tried. Far from bringing people back to that ancient law received in cloud and majesty,we have instead tried to say that after the Council we will present them a new gospel, but one focused on telling a lie: that one can obtain salvation without a deep and radical committment to Christ. In a sense, we are like the Jews the Apostles received that day. We look to do good, and may even be devout. Yet we didn’t have the true law in our hearts and on our every breath. Instead, let us return to that Gospel which has been expressed a thousand different ways throughout history, but still reflects the timeless truth that salvation only comes through committing your entire life to Christ, the very personification of the law of God which was delivered thousands of years ago upon that mountain. This is one of the fruits of the Sacrament of Confirmation. The Holy Spirit is poured out in a special way upon the faithful, and calls us first to find our fellow believers, giving them the truth of the Gospel in a way that “pierces their heart. (Acts 2:37.) While we should certainly learn the truths of the Gospel, don’t spend too much time wondering how you will do it. Just pray, and then go do it, just like Moses did on the mountain, and how the Apostles did in the Upper Room. Why is There a Crisis in the Confessional?